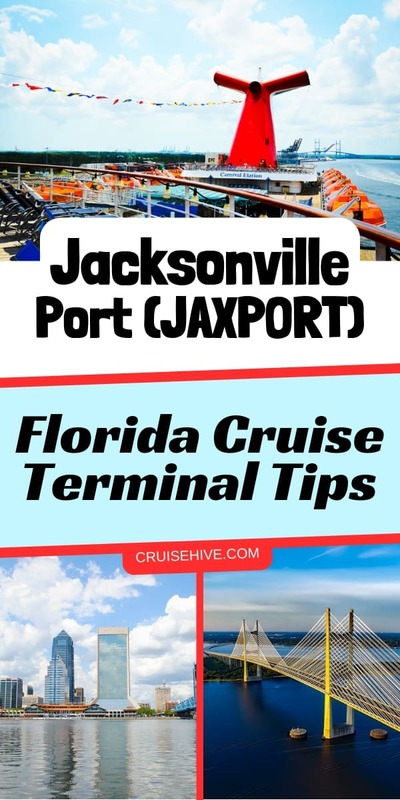 In the heart of the South Atlantic, the port in Jacksonville, Florida (called JAXPORT) has welcomed 1.5 million cruise ship passengers over the last 10 years. Find out why this terminal is so popular with cruisers. If mega-ships are not calling you to the high seas, consider booking your next cruise through the Port of Jacksonville, Florida. The Carnival Elation, a mid-sized 2,054 passenger vessel, sails year-round from JAXPORT cruise terminal. Known for its impressive choice of tasty dining options, kid-friendly areas, and balcony staterooms, the Elation departs for The Bahamas, Bermuda, and Caribbean destinations. You can choose itineraries ranging from a quick 2-day jaunt to a 9-day vacation. JAXPORT is conveniently located 12 miles from Jacksonville International Airport (JAX). This facility welcomes flights from United Airlines, Southwest Airlines, Silver Airways, JetBlue, Delta Air Lines, American Airlines, and Allegiant Air. Once you’ve landed, ground transportation to the cruise terminal is abundant via taxis, shuttles, rental cars, and private car services. If you’re driving to Florida for your cruise, parking at the port would be rated as convenient, safe, and reasonably priced. The parking facilities are literally steps from the terminal building where you will check-in. In addition to security personnel, they are fenced and lighted, adding to your safety. Fees for personal vehicles can be paid in advance online for a cost of $15/day; a $2/day savings compared to paying at the port. Parking for disabled persons and vehicles with mobility adaptations is free. You should arrive at the time designated by Carnival Cruise Line. To expedite the check-in process, it’s recommended that you have a current passport for travel. While a state-issued ID and a certified birth certificate copy will suffice, this approach will extend your time in line. Be aware that you must be holding a passenger ticket to enter the terminal. Finally, you might want to have a meal before arriving as there are no restaurants at JAXPORT (only vending machines). Here’s another JAXPORT map for general information. Mickey Mouse imports goods through JAXPORT, since the Walt Disney World Resort in Orlando is only a scant two hours away. Last year, JAXPORT imported 28 million pounds of playing cards, and exported the equivalent of 17 million 12-packs of beer. The city of Jacksonville has 1,100 miles of shoreline and 80,000 acres of parks, making it an ecological playground. You can also hit the nightlife in Downtown, visit dozens of museums, and stroll through historic districts. For sports lovers, this city hosts professional basketball, soccer, baseball, golf, tennis, and football events throughout the year. There are nine league teams in the city including the unexpected ice hockey, as well as an LFL (Legends Football League-Women of the Gridiron) team. For all of these reasons, Jacksonville has won numerous ‘best of’ city awards from respected sources such as Lonely Planet, Forbes, Business Insider’s, and Travelocity. Create an extended vacation by staying in this exciting city before and/or after your next cruise. Check out the VisitJacksonville site for tons of fun ideas.